A classic sign indeed. 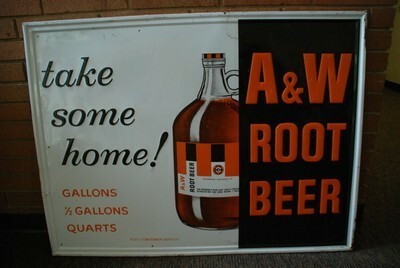 This A and W Root Beer sign shows the root beer being held in a large glass bottle. The bottle looks similar to the old milk jugs. The text is in orange, on half of the sign, and reads “A&W Root Beer”. The text on the other half of the sign reads “take some home! Gallons 1/2 Gallons Quarts.” This sign measures 46″ x 34″.